We stock two sizes of kid's batwing chaps. We have a 24" without fringe, a 24" with fringe, a 24" with colored fringe, and a 26" with colored fringe. In general, the batwings will fit 3-5 year olds. We also carry a Pee wee chink that fits most 2-3 year olds and a Jr. chink that fits most 6 years old and up. Please see the link below and provide us with your child's measurements, we can use these measurements to tell you what size your child will need. 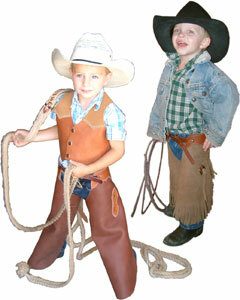 Click Here - to see how to measure for kids chaps. Click Here - for size chart.